Hey valley recording artists, we’re giving you the chance to promote your music! 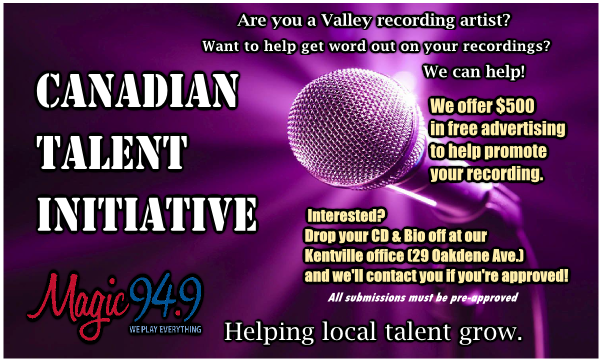 Magic 949’s Canadian Talent Initiative offers $500 in FREE advertising to help market your recording. We just need a copy of your original music, bio info, and where people can buy your music here in the Annapolis Valley. Submit your music today to our Magic Studios, 29 Oakdene Avenue Kentville, and if you’re approved, we’ll be promoting YOU through the Canadian Talent Initiative on Magic 94.9!